In a speech 10 days before Justice Antonin Scalia died, Roberts warned of a trend to approve qualified Supreme Court nominees along party-line votes in the Senate, saying it undermines the high court. “The process is not functioning very well,” Roberts said. More likely, Republican Senators were combing through everything John Roberts has said looking for an excuse to begin a war against him while at the same time blaming him for starting an argument. They finally found a just barely plausible one — unless Grassley is suggesting some sort of conspiracy of knowledge about Antonin Scalia’s coming demise. But the Lindsey Graham charges are not really plausible. The comments of John Roberts were non-partisan and rather innocuous. John Roberts was a deciding vote in the 5-4 Citizens United case which declared that money equals speech and corruption was basically not even possible. John Roberts was a deciding vote in the 5-4 case where the Supreme Court protected “unconscionable” fraud by overturning state contract law and making it harder for large groups to sue when defrauded by AT&T or other companies. John Roberts did in fact support the “Obamacare” decision that upheld the mandate — in a purely partisan decision that created a new precedent to allow the government to require Americans to purchase products for the first time. John Roberts may have had in mind the usefulness of this new taxing concept for the day when Social Security could be privatized and Americans could be forced to send money directly to Wall Street by calling it a “tax.” This was not a “liberal” decision at all. A few years earlier, John Roberts joined a 5-4 court decision upholding state vouchers provided to religious schools in Arizona under the strange theory that tax credits do not receive the same protection that tax charges do — creating a huge loophole in the Constitution. News reports at the time buried this fact deep in the article — if they covered it at all. 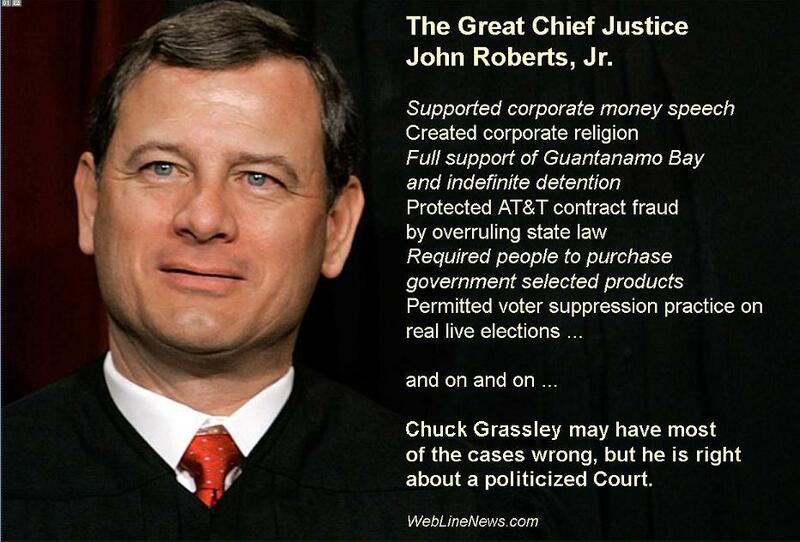 John Roberts also was a deciding vote in the 5-4 case that gutted the Voting Rights Act. Before this decision, states with histories of voter suppression had to gain pre-approval before running new election laws in live elections. Now, they run the elections corruptly and face scrutiny after it is too late. This has not gone well as recently as the Arizona and Wisconsin primaries. Lindsey Graham does not know who his friends are — or he is willing to stab them in the back for political expediency. As for John Roberts, he is not one who needs to be defended, nor is he one who should be defended — except by Republicans.